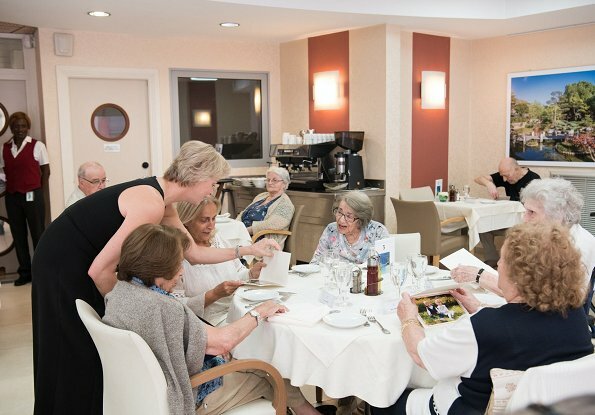 Princess Charlene of Monaco made a friendly visit to residents of Résidence A Qietüdine (a retirement home) on Saturday after celebrations of the 70th Monaco Red Cross Ball Gala and gave gifts. Among the gifts, there were photos of her twins, Princess Gabriella and Crown Prince Jacques of Monaco, that were taken a few days ago in Roc Angel Gardens. A Qietüdine which is a retirement home located near Rock Harbour in the city center is part of a national project. Charlene looks good, nice dress! Today's visit to a senior home was very much she wants to do.Her outfit looks very lovely.I hope everyone had the chance to speak with her. A nice low-key event. I like the dress and I like her slightly longer hair. She is very smiling and relaxed - she seems to enjoy these less grand engagements more. Love her style - she always looks stunning. J'aime bien comment est sa nouvelle coupe de cheveux. Une visite dans une structure pour personnes âgées qui me plaît beaucoup ayant travaillé plusieurs années dans une HEPAD. Je ne la connais qu' à travers des photos.Elle me paraît douce. Je la sens très à l aise et souriante. Wonderful visit and pretty summer dress. I also agree that her is looking very attractive at this length. A black dress is always a good idea. Yes it is hot today, but for my taste the neckline is not too flattering. I have the feeling, that you want to offend me. That´s sad. You don not know me. Sad. J'aime bien sa coupe de cheveux! Pour une fois, je trouve Charlène parfaite ! Bien habillée, à l'aise, naturelle et souriante. Charlene is without question one of the most beautiful royal ladies, and seems to be getting lovelier, and more comfortable in her role, all the time. However, I am sometimes puzzled by her fashion choices, and this is one of those times. Why such a somber color, and especially, why such a low-cut dress for an afternoon visit to a home for the elderly? It seems a strange choice to me. She looks amazing happy and so involved with the people. I am very impressed with commitments of Princess Charlene of Monaco to charity and humanitarian activities. I am very impressed to see her heart-warming personality. Belle Princesse! jolie,souriante , agréable de la voir comme cela. I am very impressed with commitments of Princess Charlene of Monaco to humanitarian activities. I love her heart-warming beautiful smiling face. She looks so good with only a hint of make up and casual clothes. van!!!! !ik ben gek op haar !!!! !